If sitting through a full length show this weekend feels a bit daunting, than perhaps three one-act comedies may be of interest instead. One Three Hill is a 90 minute romp through three original one-act plays being put on in the Passe Muraille Backspace by Daisy Productions. Though I had very high hopes going into it, to me this show felt like a playlist of songs that I wasn’t a huge fan of. If I had to choose, I’d say I preferred the first show. My guest enjoyed the second most and we both felt the third completely succumbed to pacing issues. Though truthfully that seemed to plague all of these plays in some capacity. The first show, Stuck in the Sky, is about a group of people trapped in a CN Tower elevator. It was written and directed by Melly Magrath and my favourite of the evening. I enjoyed the interplay between all of the characters and each made me chuckle at points. I was particularly fond of Candace Meeks as the crass, insensitive elevator attendant. A lot of Stuck in the Sky’s humour seems to come from the awkwardness of the situation the characters find themselves in. At times the awkward pauses got a bit long and uncomfortable, but I thought they landed well enough. I was frustrated though that the action never really picked up. You’d think that tensions would build to some kind of climax given the show’s premise, but the energy remained very consistent throughout. The second show, Life Boat by Marc Prey, felt more cohesive than the first but didn’t offer as much to me in the way of humour. I found it curious that Life Boat didn’t deliver some very obvious punchlines even after those jokes seemed to have been set up. I’m not sure if this was deliberate, but I didn’t find the show offered much instead of the cheaper laughs it could have delivered. And I personally feel that in a comedy, I’d rather laugh than be silent, even if it’s a cheap joke. What Life Boat really had going for it though was being quite cute. The writing, while not particularly funny to me, was very endearing. It was elevated by the heartwarming performances of its two leads, Richard Comeau as Albert and Kelly Taylor as Kiki. Watching the unlikely duo warm up to each other as they were lost at sea was pretty charming. The third show was The Other Side of the Rhyme by Alyssa Wright, a dark comedy about nursery rhyme characters living together in total disharmony. This one started strong, anchored by a good performance from Caitlyn Turner as the (not so old) Woman Who Lived in a Shoe, but it turned out to be a bit tedious. There were some memorable moments in The Other Side of the Rhyme, as well as a few good gags, but overall I didn’t find it very funny. The portrayal of a day in the town of Nursery didn’t seem to flow very well as it switched between characters. I also felt that the involvement of “Mother Goose” was a bit confusing to me. Overall, things felt disjointed and I felt like I just wasn’t getting something. Truthfully, I didn’t really enjoy One Three Hill. There were some bright spots, but overall I felt that most of the humour fell flat. Across the board, I thought the premises for all three shows were fine but that each play could stand to go through a few more edits. With all that said, I was still happy to see some original theatre and would absolutely be back to see Daisy Productions’ next collection of plays. Kind of like a Spotify playlist, I may not have liked what I got this time but I’ll be keeping an ear out for whatever else they’re playing. One Three Hill is playing at the Passe Muraille Backspace (16 Ryerson Ave). Performances run from September 8-11, 2016. Shows are at 7:30PM Thu, Fri, Sat. There is a 2PM matinee on Sun. Run time is approximately 90 min. 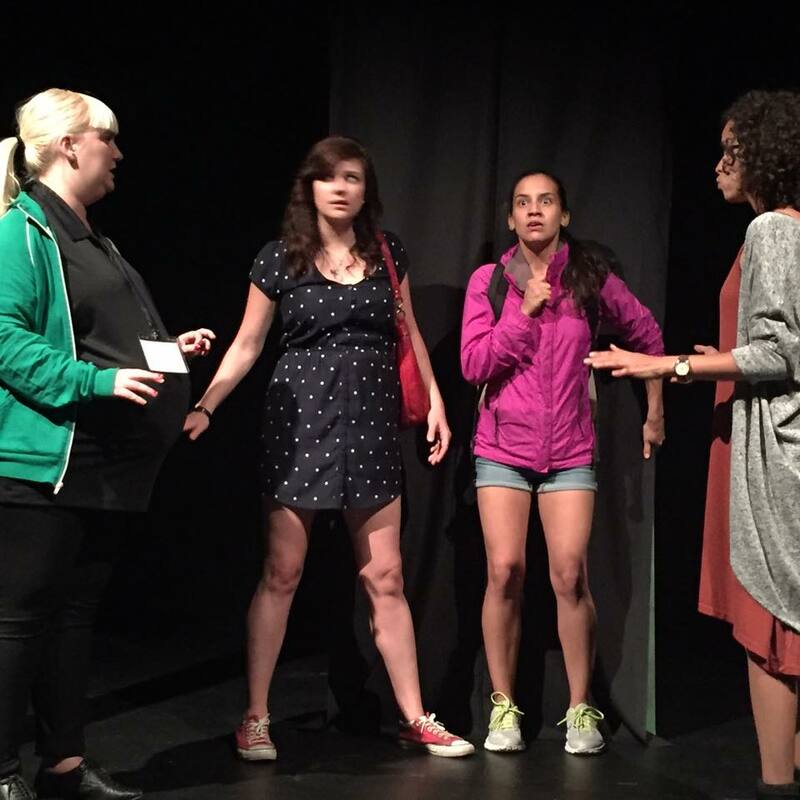 Photo of Candace Meeks, Ivana Kingston, Naama David, and Sofia Rodriguez from Stuck in the Sky. Image provided by Daisy Productions.